Simba has revitalised the look of Fritos, its popular corn chip brand, giving it a fresh new look to drive additional interest and engagement in the snack aisle. The packaging re-launch is focused on refreshing the range of fun and flavourful corn chips to address consumer needs while boosting brand exposure in retail outlets. 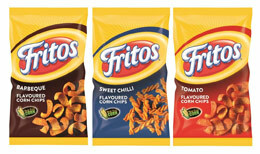 The revamped Fritos range now features a clean, clear and distinguished design with a more prominent logo. Available in three flavours, Barbeque, Tomato and Sweet Chilli, Fritos new packaging design offers consumers an authentic and memorable pack with strong flavour and format visuals. The brand packaging re-launch will be supported by PR and in-store branding.